139 thousand tonnes of carbon dioxide would fill a sphere 521 metres across. To most Londoners, ‘139 thousand tonnes of carbon dioxide’ is not a very meaningful quantity. 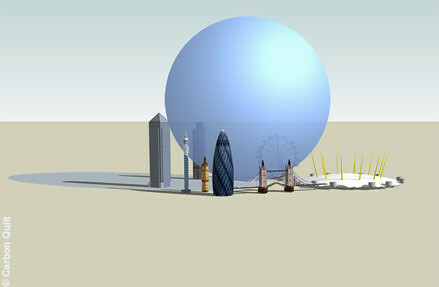 Illustrating it in the context of London landmarks allows viewers to make it meaningful for themselves. The illustration is compelling not just because it is visual, but because we can relate to it on a physical level. Londoners – the primary audience – know what it is like to walk across Tower Bridge, or stand near to the Post Office Tower, and so can ‘feel’ how big 139 thousand tonnes really is.